Ken Norton was one of these guys who the further he got into his playing career, the meaner he looked. I mean you just didn’t want to approach him his last year in Dallas as he just brooded. I think I got Ken either my first or second day at camp. It’d be the only card I’d get signed of his, as he just didn’t stop very often to sign cards. Ken Norton Jr is the son of former heavyweight champion Ken Norton. 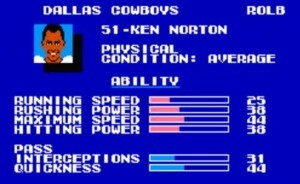 Drafted in the second round from UCLA by the Dallas Cowboys in Tom Landry‘s final draft as coach, Norton spent the majority of his rookie season in 1988 on injured reserve. He’d gradually work his way into the lineup in 1989, splitting time with Jesse Solomon (fresh from the Herschel Walker trade) at weakside linebacker. Norton would be moved around the linebacker corps as his greatest attribute at the time was his versatility while dealing with injury. 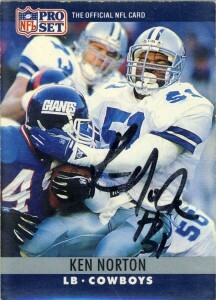 By 1992 Ken had become a key cog in the Cowboys defense and scored a touchdown in SuperBowl XXVII. His 1993 would be his last in Dallas. The team had identified linebacker as a budget position and felt that they could find cheap talent in the draft. Norton would hit the road and head out to San Fransisco with the advent of free agency where he played consistently through 2000 before retiring. Ken would be named to the ProBowl twice in his career and All Pro in 1993 and 1995. He is also the first player to win three SuperBowl titles in a row and also remembered for a bone crunching hit that ended Napoleon McCallum‘s career. Ken would go into coaching where he was signed by the USC Trojans to coach linebackers and also started honing his skills at broadcasting. In 2010 Norton Jr would join Pete Carroll’s staff in Seattle where he is serving also as a linebackers coach.